Eddie Alvarez catches his breath during a break in his media day workout at Joe Hand Gym in Philly prior to facing Conor McGregor last November. 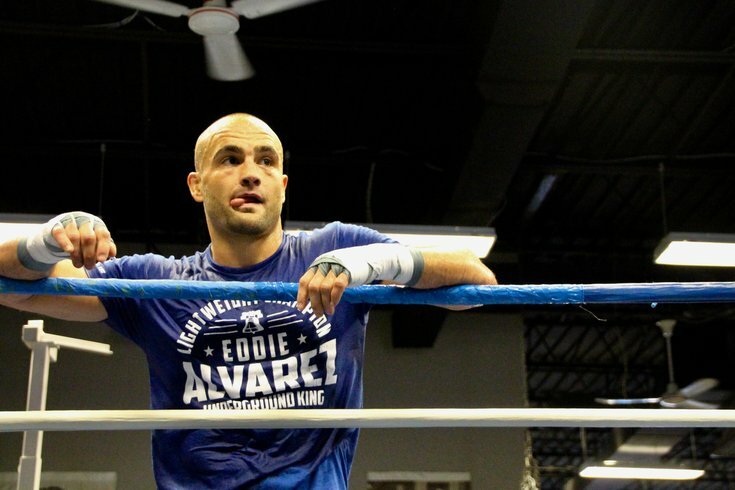 Win or lose, Eddie Alvarez will be going to Disney World. The former UFC champ isn't waiting until after his fight with Dustin Poirier on Saturday night at UFC 211 to decide what he's going to do next. He already has the trip booked – and when he leaves Dallas, he and his wife, Jamie, will pick up their four children in Philly before whisking them off to their favorite vacation destination. But before riding Splash Mountain or getting Mickey's autograph, Alvarez has some business he needs to handle. And the circumstances under which the 33-year-old Kensington native will enter the UFC octagon – a non-title bout as part of the free undercard on FX – are much different than his last fight, when he carried the lightweight belt into Madison Square Garden to face the sport's biggest name as the main event of the UFC 205, the most star-studded card in the promotion's history. I think the neglect of not setting a goal after I won the title wasn’t good. I’m definitely a hunter by nature, and I need something to hunt. For Alvarez, that night ended in disaster, with him sprawled out on the canvas as Conor McGregor, draped in an Irish flag, danced around him in celebration. It was the first time he'd been knocked out in almost a decade, and just the second time in his nearly 15-year professional career. The self to which he's referring? Alvarez the Hunter. For a fighter who spent so many years chasing his profession's ultimate prize, finally winning the UFC belt can be likened to the dog who chased the car but didn't know what to do with it once he finally caught it. “It does [mean something different when you’re chasing the title]. It definitely does," Alvarez admitted. "I think the neglect of not setting a goal after I won the title wasn’t good. I’m definitely a hunter by nature, and I need something to hunt. I sort of got the title, and we wanted a big-money fight. We got the big-money fight. So I found myself laying there after I got the world title saying, ‘OK, so what’s next?’ And I never really made any goals. Alvarez (28-5) isn't just happy about the chance to get one step closer to getting his belt back. He also feels the need to prove to the fans (and himself) that he's not only back, but that he's also still the best fighter in his weight class. At UFC 205 at The Garden, the site of Alvarez's most recent bump in the road, he was such a crowd underdog that fans even booed during his walk-in song, "Victory." There's something unnerving about hearing boos during a Biggie song, especially in NYC. And when a semi-unconscious Alvarez hit the mat midway through the second round, it was a cascade of cheers and a different song that rained down on McGregor. No longer the champion, Alvarez left the arena in a flash. And after a tear-filled drive away from the arena, he returned home and began to pick up the pieces, thanks in large part to the support of his fans. “In Philly, I’ve got nothing but love. Anybody who spews hate, I don’t pay much attention to anyway. Most of the time, it’s just a social network thing anyway. I pay so much attention to the love, and it was so much easier to get back on your feet when you get that encouragement. And the people of Philly did nothing but tell me they want to see me back in the cage. They want to see me fight. That support is part of the reason Alvarez has been so dead set on bringing a UFC card to Philly, something that hasn't been done since 2011 when he was still with Bellator. “I’ve got to get the belt back again, and basically just hold it captive until they come back to Philly,” he said. In order to do that, Alvarez will first have to defeat 28-year-old southpaw Dustin Poirier (21-5). The 9th-ranked lightweight last fought on Feb. 11, a majority decision win over Jim Miller. In his career, Alvarez has found great success against lefties – with the notable exception of his most recent loss. Given that the last punch he took in the octagon was a vicious left hand from McGregor that ended the fight and left Alvarez dazed on the mat, you'd think the North Catholic grad would have PTSD-style flashbacks about facing another southpaw. And despite the fact that Poirier has lost just twice in the last five years – his most recent being a first-round TKO loss to McGregor in Sept. 2014 – Alvarez doesn't seem worried. “I’m looking for him to go down as quickly as possible," he added with a laugh. Because the quicker Poirier goes down, the quicker Alvarez can get on to more important things ... like a date with his wife, kids and a certain oversized cartoon mouse in Florida.